"How to Write This Book" is a kid's guide to learning the basics of writing a story. 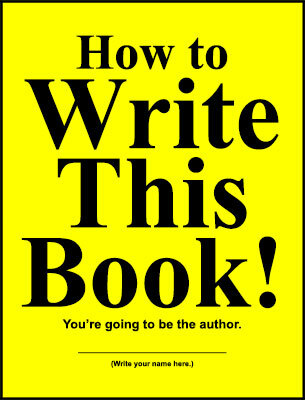 How to Write This Book! You're going to be the author. This is a young author's guide to writing a book. All authors, even the ones who wrote the classics, started out as kids. Nobody knows when the masters started writing, but if they'd had help early on, maybe those classics wouldn't have to be assigned reading. With early literary intervention Faulkner, Hemingway, Twain, and Capote could've had a giant step forward into the world of writing. An aspiring Homer could have had guidance in his writing. Little Dante could've done even better. And young Shakespeare, too. It's not too late for the kids of today. Start here. Write This Book! When it's finished, scan it and email a copy to authors@howtowritethisbook.com. If we can, we'll publish it on our young authors website at www.howtowritethisbook.com. Jimmy Huston, a longtime screenwriter, met his wife in a college writing class, which explains why he wasn’t paying attention. He also has two daughters who are writers and has learned enough from all of them to write a few books on his own. He has occasionally taught writing in college.